Two comics from February 5, 2014. 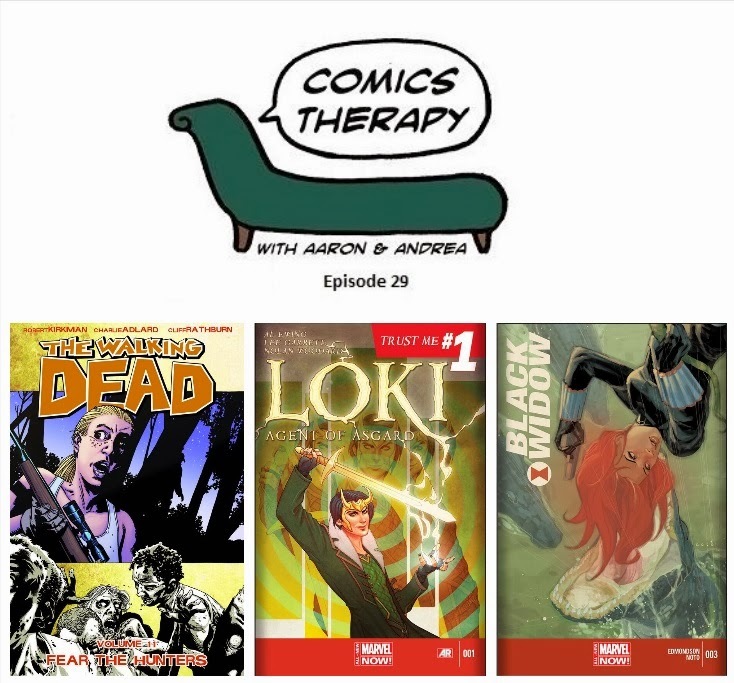 Plus your Nerd Confessions (featuring comics lies) and Aaron's Inner Child. And after a three month hiatus, we welcome back the return of Grief Counseling. This week’s theme is all about lying. Lies we tell ourselves. Lies we tell each other. Sometimes they’re the same, and sometimes they’re dangerously different. As a storytelling device, they can be exciting, stressful and hilarious. In real life, it’s a lot more complicated. Both of the solo books we’re analyzing this week feature characters known for their crafty web of lies. It’s a good time to have deception as your superpower in the Marvel universe. ...but knowing who you want to be moving forward is priceless. Last year, Andrea started reading The Walking Dead for the first time. The consequences were fairly dire, with lots of wailing and gnashing of teeth. But as time went on, she grew to love tolerate this series, much to Aaron's sick delight. It's been three months since we last checked in. You may be surprised to see how this turns out.